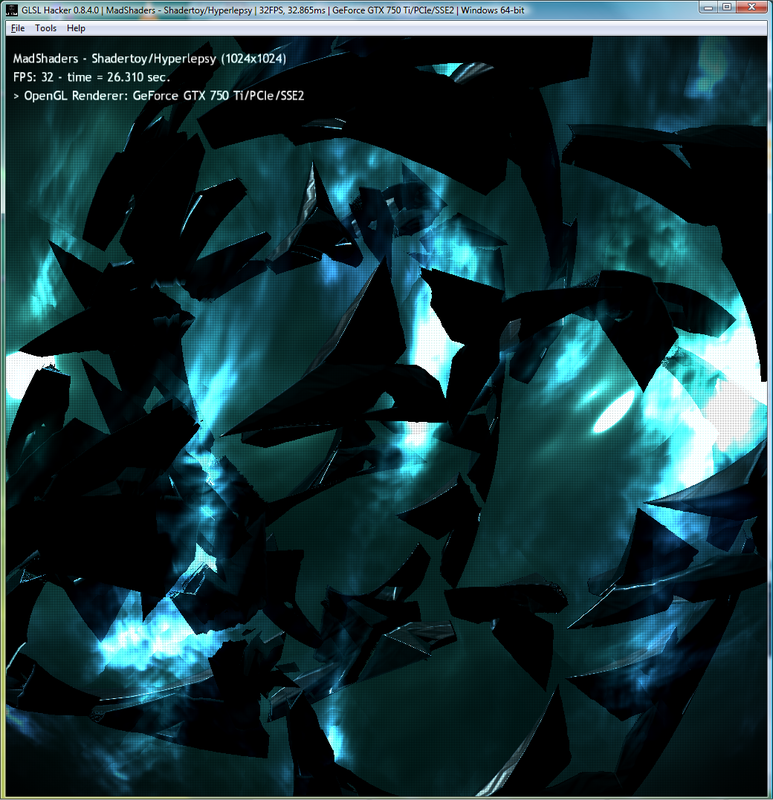 <window name="win3d01" title="MadShaders - Shadertoy/Hyperlepsy"
Mostly about Volumetric field/geometry interaction. techniques being used whenever possible. I wasn't willing to compromise too much on the look. No idea is the VR is working properly, let me know. //but the alignments isn't ideal..
vec3 F = m.f0 + (1. - m.f0) * exp2((-5.55473*lh - 6.98316) * lh); //"optimization"
2015/6/1@20:39:35(0000000007) <!> Python 2.7 installation not found: unable to load Python core library (python27.dll). 2015/6/1@20:39:35(0000000035) < > [OpenCL] OpenCL data initialized ok.
2015/6/1@20:39:35(0000000038) < > [PhysX3] GPU PhysX init ok (valid CUDA context manager). 2015/6/1@20:39:35(0000000050) < > [PhysX3] started ok.
2015/6/1@20:39:35(0000000051) < > [FFmpeg] plugin started OK (id=10). 2015/6/1@20:39:35(0000000057) < > Window main_window3d - demo created with an OpenGL 4.5 context. 2015/6/1@20:41:27(0000000086) < > [FFmpeg] plugin stopped OK (id=10). 2015/6/1@20:41:27(0000000097) < > [OpenCL] OpenCL data initialized ok.
2015/6/1@20:41:27(0000000098) < > [FFmpeg] plugin started OK (id=10). 2015/6/1@20:41:27(0000000100) < > Window win3d01 - demo created with an OpenGL 4.5 context. 2015/6/1@20:41:27(0000000127) <!> GPU program shadertoy_prog - Pixel shader info log: 0(119) : error C1115: unable to find compatible overloaded function "sin(float, float)"
0(119) : error C0000: syntax error, unexpected ';', expecting ')' at token ";"
0(250) : error C0000: syntax error, unexpected ';', expecting ',' or ')' at token ";"
0(273) : error C0000: syntax error, unexpected '. ', expecting "::" at token "." 0(281) : error C0000: syntax error, unexpected '. ', expecting "::" at token "." 2015/6/1@20:41:27(0000000128) <*> GPU program shadertoy_prog - Pixel shader error: 0(119) : error C1115: unable to find compatible overloaded function "sin(float, float)"
Pixel shader info log: 0(119) : error C1115: unable to find compatible overloaded function "sin(float, float)"
2015/6/1@20:41:27(0000000130) <*> The scene graph contains ERRORS. Check the log file for more details. 2015/6/1@20:41:38(0000000131) < > [FFmpeg] plugin stopped OK (id=10). Then you have the right path for the textures.